Tarzan comes to Blu-ray and DVD! The new jungle adventure Tarzan is finally out on Blu-ray 3D/2D and DVD on 25th August! When a helicopter crashes in the heart of the jungle, only one boy – John Jr. – survives. Found and raised from that day forward by a family of primates, John becomes Tarzan and learns how to live in the wild. But now, years later, the jungle needs his help as the evil CEO of Greystoke Energies threatens its very existence in search of a new energy source. The film uses incredible new special effects and 3D technology to re-make this classic adventure. Plus, on the Blu-ray and DVD you can enjoy all sorts of special features like the making of Tarzan, Animal shoot and Behind-the-Scenes with Kellan Lutz and Spencer Locke – two of the stars in the film. 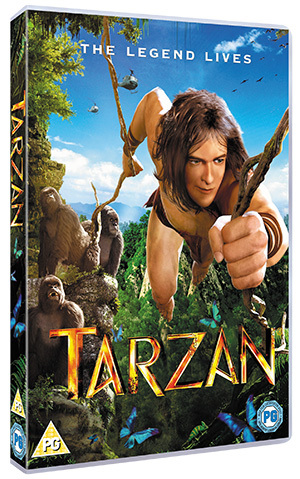 Tarzan is out on Blu-ray 3D/2D and DVD on August 25 from Entertainment One.